Fried chicken is one of the simple pleasures of life made immortal by almost every culture with access to chicken. They all do it a little different, but they’re almost always delicious. The biggest differences usually involve the style of breading, seasonings, and occasionally the frying method. Simple is usually best, but when going for maximum crispiness and minimum greasiness, the Japanese really know how to fry. I had the pleasure of trying tonkatsu, which is actually a fried pork cutlet using panko crumbs in Japan (the “ton” part means pork in Japanese). It was crispy, beautifully golden, juicy, and not greasy at all. Simply fantastic. 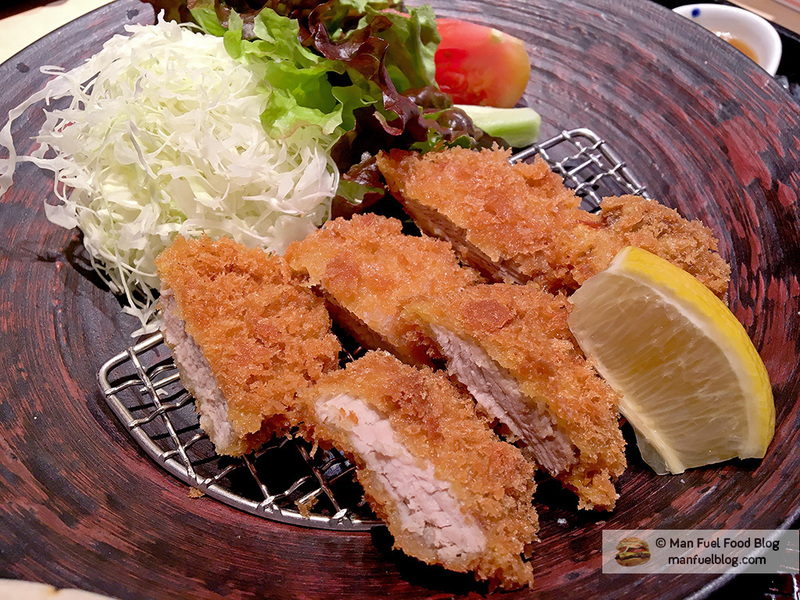 The chicken version is often referred to as chicken katsu in English (the “katsu” part is short for “katsuretsu.” which means cutlet). As a lover of fried chicken, I wanted to recreate this wonderful dish at home. It turns out that it’s very easy to make and comes out wonderfully. The best version is if you can get your hands on real flaky Japanese panko. The kind we often get at the supermarket will get the job done, but the panko pieces are really more like crumbs rather than nice flakes. Regardless, it’s worth trying this recipe if you’re looking for something a little different than the usual American style fried chicken. The simple flavors of the chicken shine through while the crispy breading adds crunch without soaking up a lot of grease (that’s the beauty of panko breading). 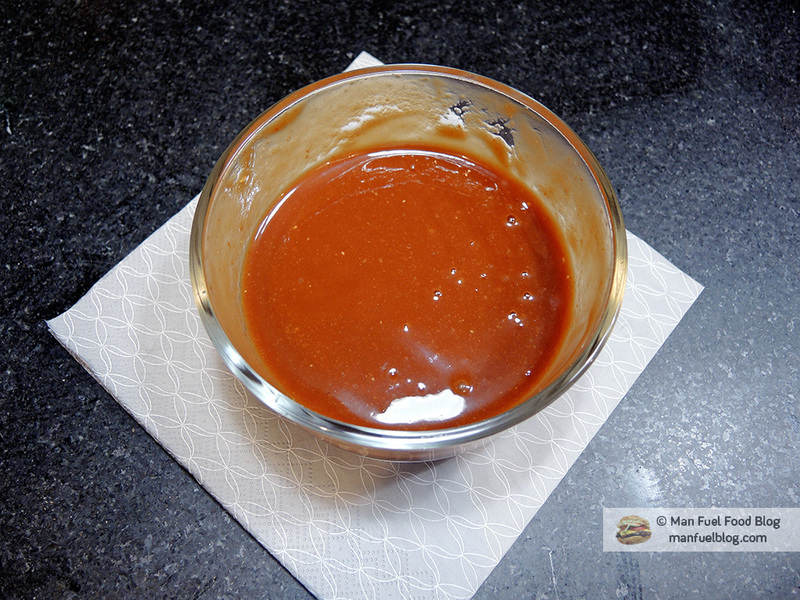 Meanwhile, the tonkatsu sauce recipe makes a wonderful topping unlike any American condiment out there even though it’s basically made up of a lot of condiments found on American tables. If you look at the ingredients, it’s almost like tonkatsu sauce is a Japanese joke that mixes a bunch of American condiments into one sauce like kids mixing all the fountain sodas together, but in this case the punchline is that it’s somehow delicious. Lastly, the cabbage adds a vegetal, erathy crunch while the sesame flavor really drives home some of the Asian inspiration of the dish. Perfectly crispy and fried chicken katsu over sesame cabbage. 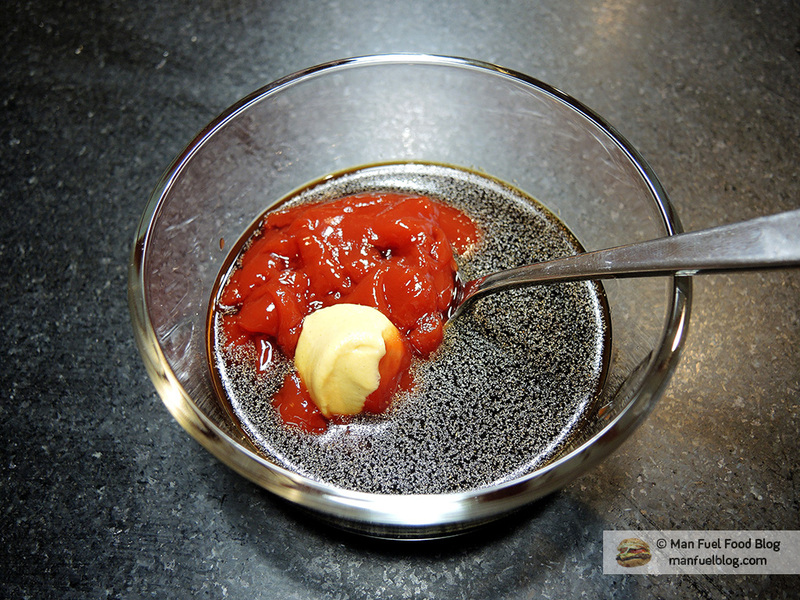 The first step is to mix up the tonkatsu sauce in a small bowl. Just combine all of the ingredients together and mix mix well. Cover the sauce with plastic wrap before putting it in the fridge until the food is ready. 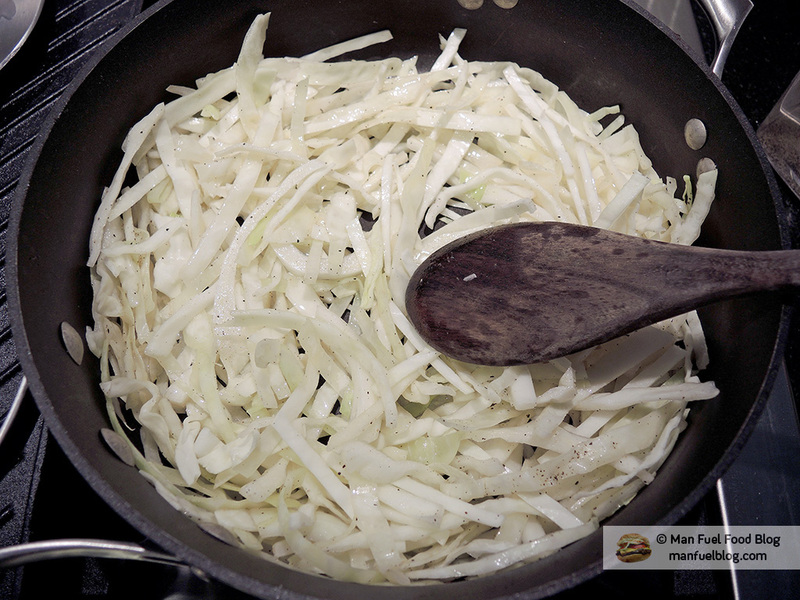 Finely chop or shred a quarter head of green cabbage into long strands to get it ready for cooking later. Depending on how large or thick your chicken breasts are, the first step is to butterfly them so that the two large chicken breasts become four. You can split a chicken breast using a long sharp knife and slicing along the thick part of the breast to create two almost equally sized breasts. If the chicken breasts you have aren’t too thick as they are (i.e. not thicker than an inch) then move on to the next step. 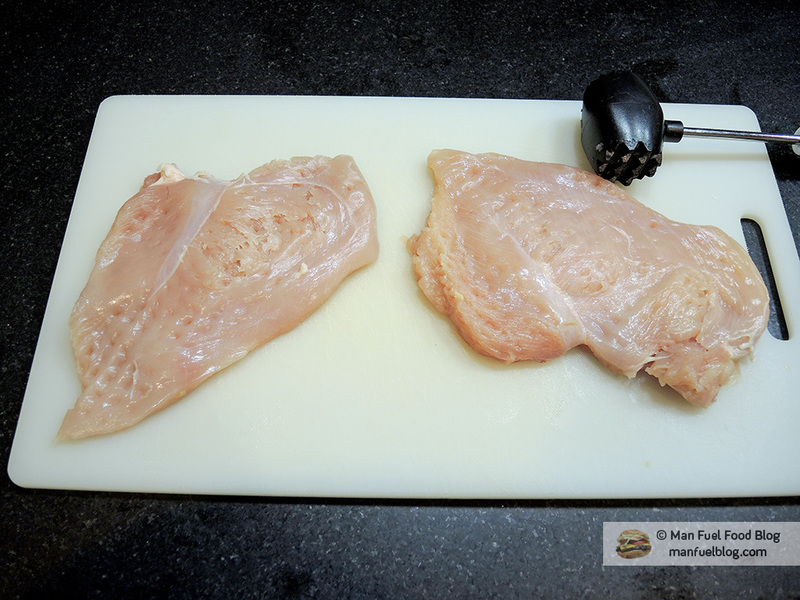 In order to flatten the chicken breasts, use a meat tenderizing mallet and lightly pound out the chicken so that it becomes wider and flatter. Don’t pound too hard because you don’t want to tear the meat. I like to switch between using the pointy side of the mallet and the flat side to get the breasts to about 1/2″ or 1/4″ thick. Some people lay down plastic wrap on underneath and on top of the chicken before they pound it out to keep it from sticking to the board or mallet. With the chicken pounded out, take a liberal pinch of salt and pepper to sprinkle over each side of the filets. Now, it’s time to create the breading station. Place a 1/2 cup of flour on a flat plate and 1 cup of panko crumbs on another plate. In a shallow bowl crack 2 eggs and beat them until well mixed. 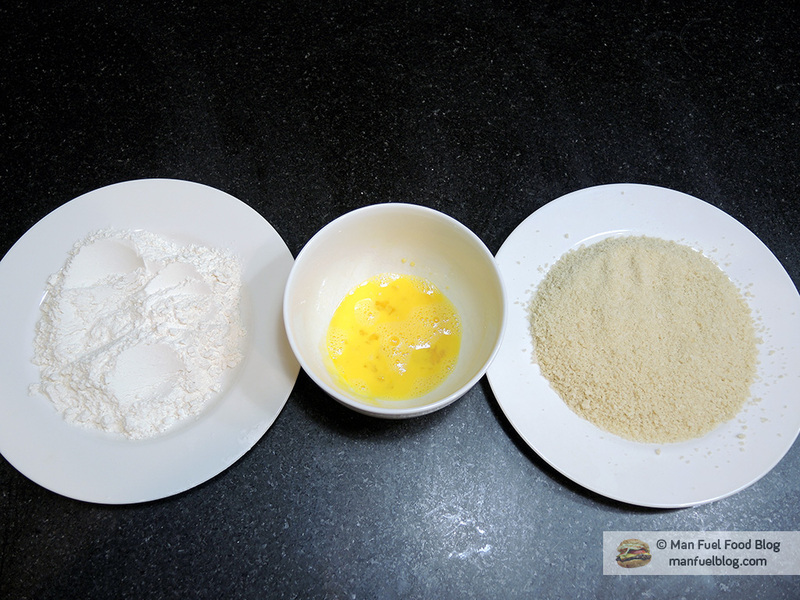 Begin breading the chicken by first coating it thoroughly in flour, then dip it into the bowl with the beaten eggs and quickly coat it in egg. 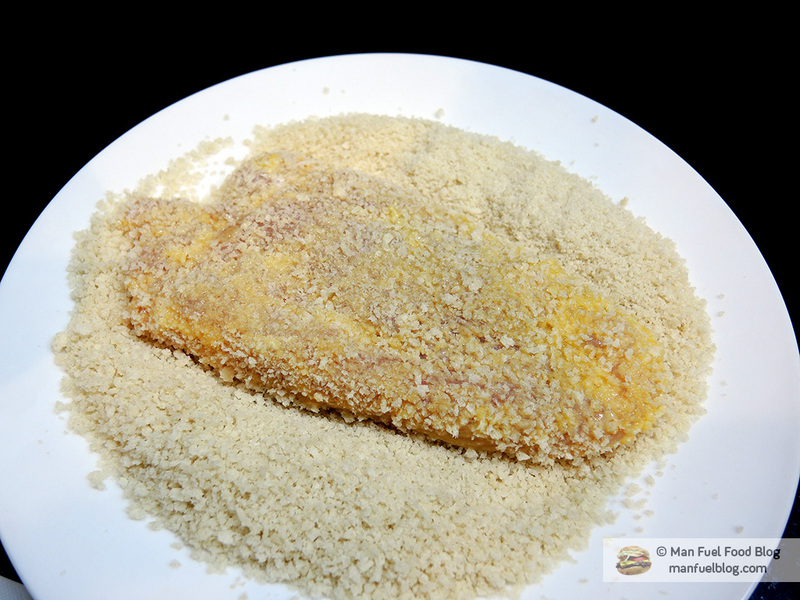 Lastly, press the chicken into the panko crumbs until completely coated. Place the chicken aside on a large plate or tray until ready for frying. Repeat this process with the rest of the chicken and don’t stack the chicken on top of one another or the breading might start to come off. At this point, the chicken can rest while the cabbage is prepared. I like to cook it at the same time as the chicken so that everything is hot at the same time. However, if that seems too daunting, then cook the cabbage first and just keep it warm before cooking the chicken. In a large deep saute pan, add one or two tablespoons of canola/vegetable oil and bring the temperate up to medium-high heat. When the oil is hot, add the cabbage to the oil. Add in 1/4 teaspoon of salt and 1/8 teaspoon of black pepper. Add in the teaspoon of sesame seeds and lastly add in 1 teaspoon of sesame oil for lighter sesame flavor or two teaspoons for heavier sesame flavor. Saute the cabbage until it is just about to wilt, but isn’t soggy. It should retain some of its crunch when eaten. 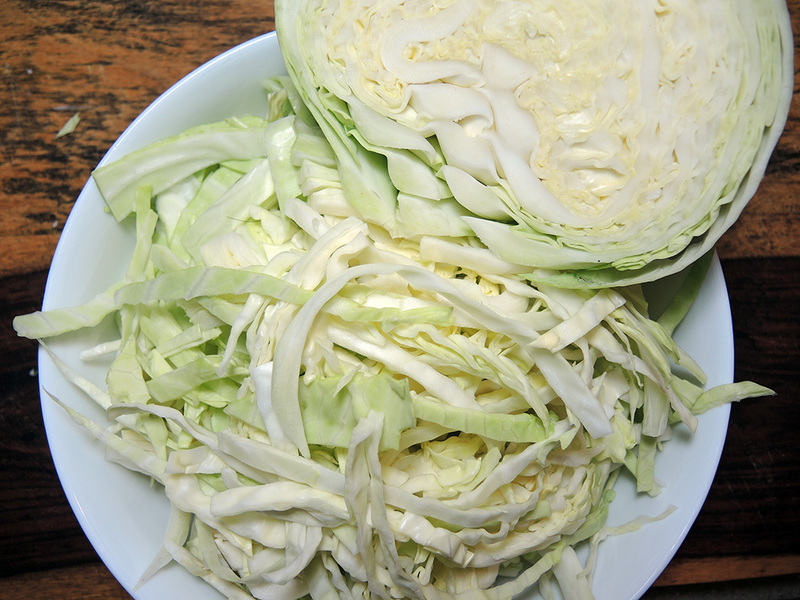 Set the cabbage aside and cover it with a loosely placed lid or tented aluminum foil until ready to eat. 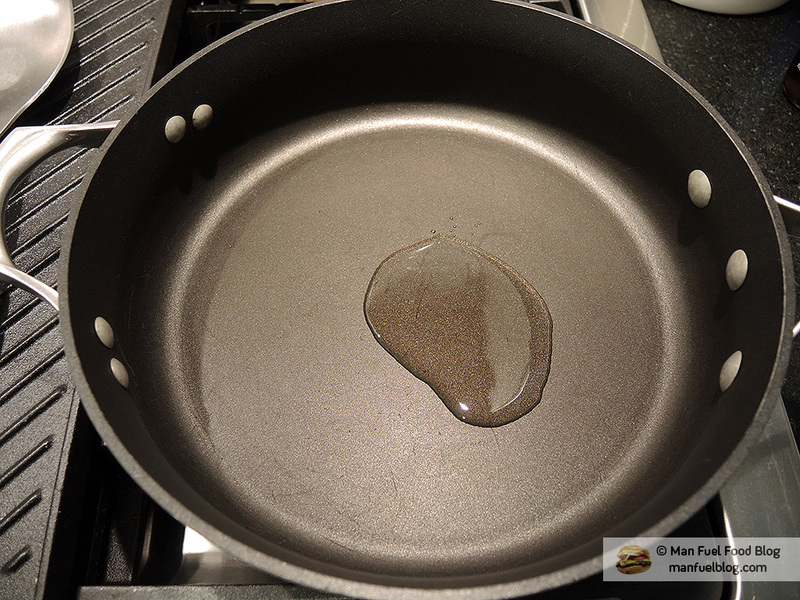 For the chicken, fill a shallow frying pan with about 2 cm to an inch of canola/vegetable oil. Bring it up to 350 degrees F if you have an oil thermometer. If not, just set the temperature of the stove to just under medium heat. The oil needs to be just right. Otherwise, the breading will burn and the chicken won’t cook properly or the breading will get soggy and the chicken will over cook. When the oil is ready (it should shimmer and not smoke), place one or two chicken breasts into the pan at a time depending on the size of the pan. Don’t overcrowd the pan. 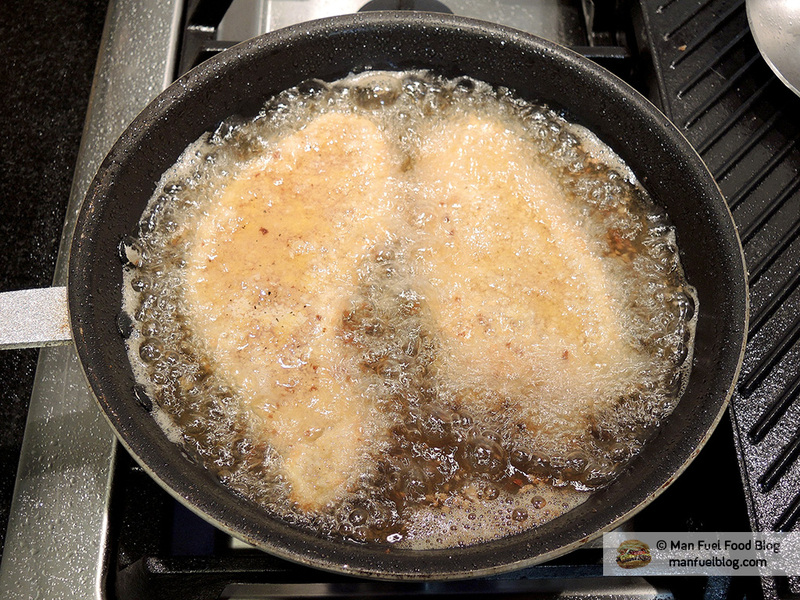 Fry the chicken on one side for about 2 or 3 minutes until the breading is a deep golden brown. Flip the chicken and fry it on the other side for another 2 or 3 minutes. 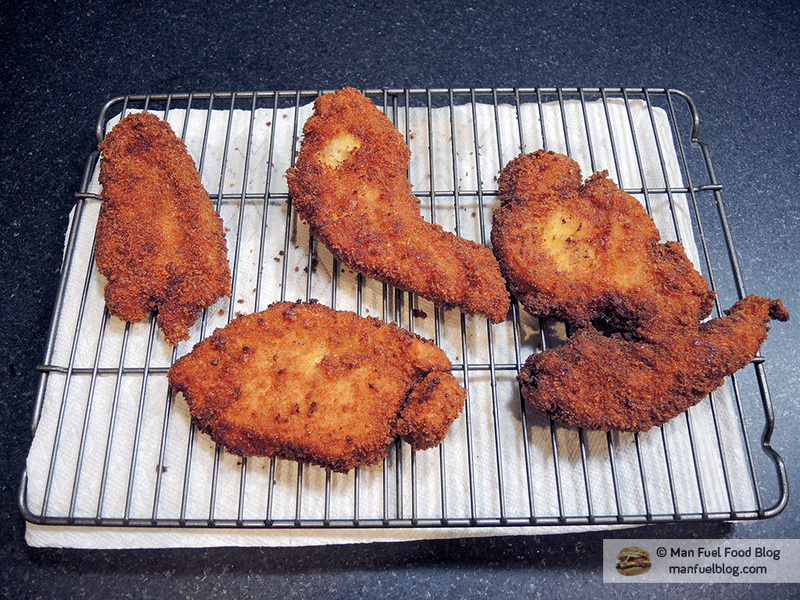 The thickness of the chicken will dictate how long they need to remain, but once the chicken’s liquids are clear and the breading is golden brown, they should be ready. Set the chicken aside on a plate lined with paper towels or a cooling rack to let the chicken rest briefly. When ready, slice the chicken across the width into roughly 1-inch strips using a very sharp knife prior to serving it. 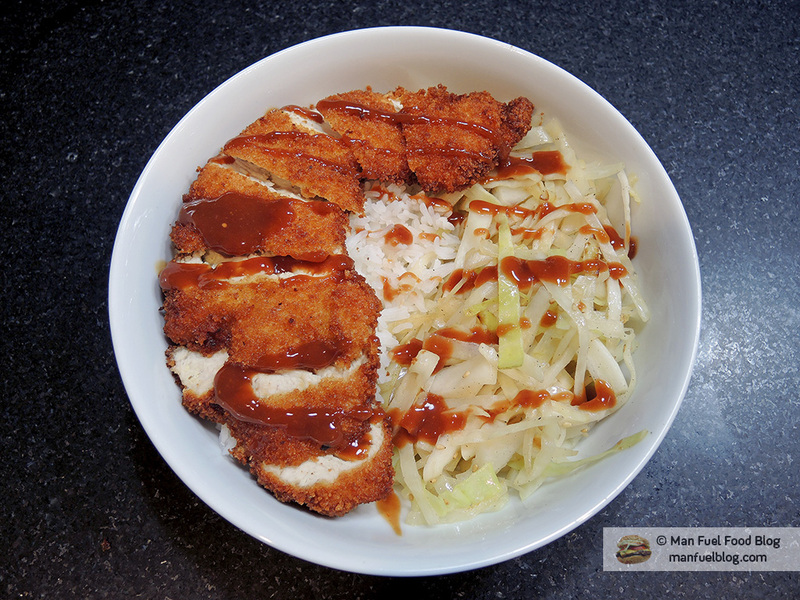 Then place it over a bed of the sesame cabbage and drizzle some tonkatsu sauce over it. Optionally, add some steamed white rice to the dish as well as an accompaniment. I made this the other day and my wife told me I had to make it again soon! Really good. We loved the crispiness of the breading. It wasn’t heavy at all either. The sauce is fantastic too! It’s not to sweet and it’s thicker than usual which we really liked.